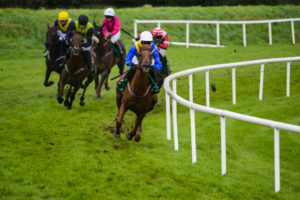 Today Bitcoin price pulled off a minor relief rally, but will the king of cryptocurrencies maintain momentum as volume fades? 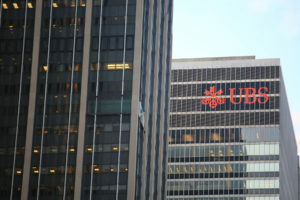 This week has been a tough one for cryptocurrencies as the total market capitalization dropped to $228 billion, which is roughly 24% down from the July 27 high of $300 billion and significantly removed from the $830 billion market cap of December 2017. Fortunately, BTC 00 did find sellers as it bounced off $6,132 and has since begun the upward trek to climb over $6,500. 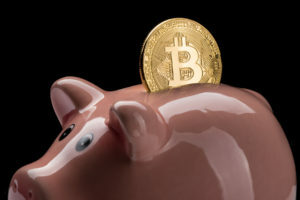 It seems that the shockwave caused by the SEC’s postponement of the upcoming Bitcoin-ETF decision has passed and a close above $7,000 would place BTC back above the ascending trendline on the weekly chart. BTC has fallen below the ascending trendline and dropped below the 50-week MA and the 55 EMA. Bitcoin broke below the 50-week MA, coming within $121 of the $6k support and falling below the ascending trendline and the 55 EMA. This is the third time BTC has descended near $6,100 so buyers are likely to show up around this region. The drop below the 50 MA was followed by a move below a crucial support at $6,800 which closely aligns with the 61.8% Fib retracement level. While BTC has recovered nicely from $6,132 and currently tests the 20-day MA. 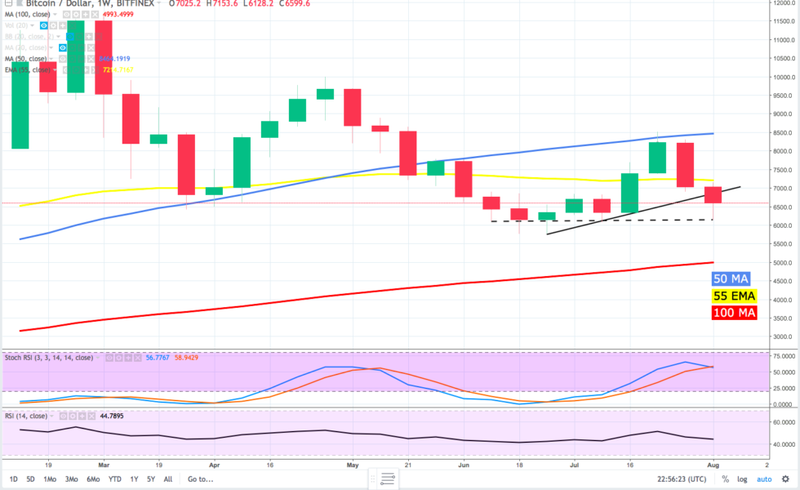 BTC still trades below the ascending trendline at $6,800 and the RSI has begun to reverse from oversold territory while the Stoch remains deeply oversold. Today’s corrective rally from $6,132 to $6,573 was sustained by high volume and managed to bring BTC closer to trading above the 20-MA but the 4-hour chart shows the Stoch approaching oversold regions and the RSI nears bullish territory. 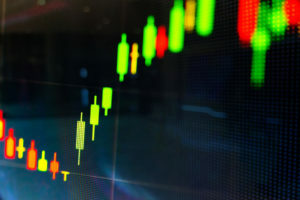 Volume has begun to taper off, suggesting buyers are losing steam and the pattern of BTC being rejected at the moving averages on the 4-hour chart remains. 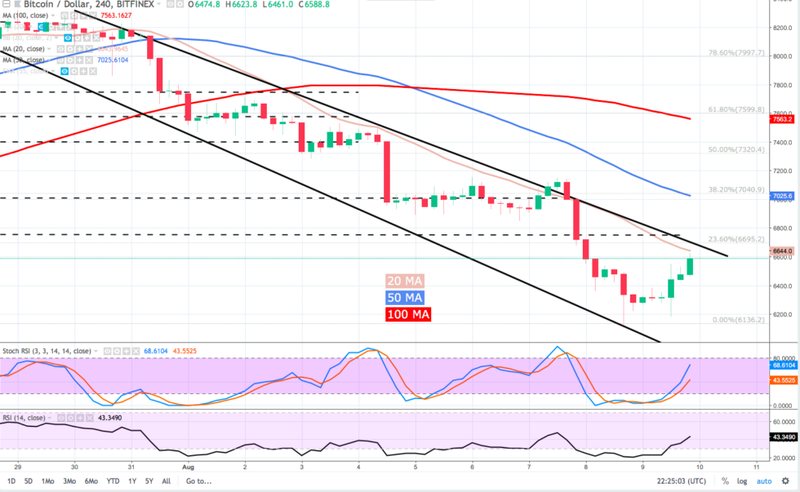 At the time of writing the 1-hour chart shows the 5 MA crossed below the 10 MA and both oscillators have dove deeper into bearish territory, which suggests bears have wrested back control of BTC and prices may pull back to $6,200. BTC needs to gain above $7,000 to restore its place in the ascending trendline on the weekly chart. 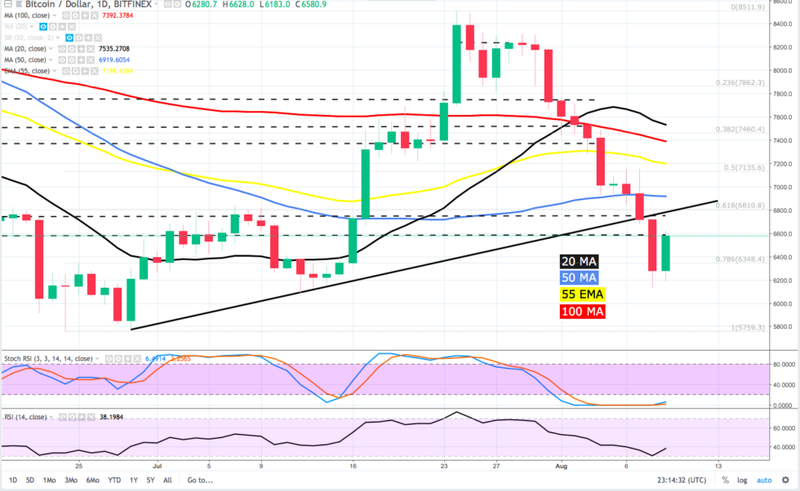 The pattern of rejection at the overhead moving averages on the 4-hour chart continues, today BTC momentum was halted at the 20 MA ($6,630) on the 4-hour chart. Today’s relief rally appears to be losing momentum as volume has evaporated and the short-term moving averages have turned bearish on the 1-hour chart. The current technical setup suggests BTC 00 could pullback and possibly revisit the $6,250 support.